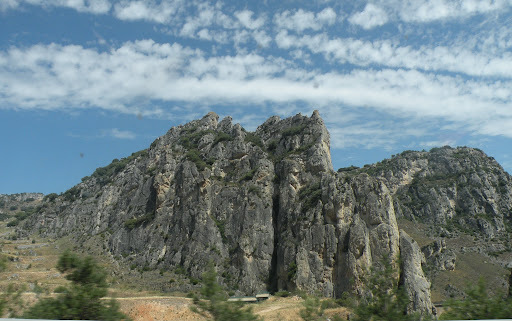 We left San Sebastian on July 18 to drive down to Salamanca. Although the freeway was pretty clogged with big trucks, Gregg found the driving reasonably stress free and the scenery was surprisingly varied. I had thought that the middle of Spain would be a bit flat and bleak but no such thing. Here’s some interesting mountains I snapped from the car. We also spied one of the famous bulls guarding a hillside. 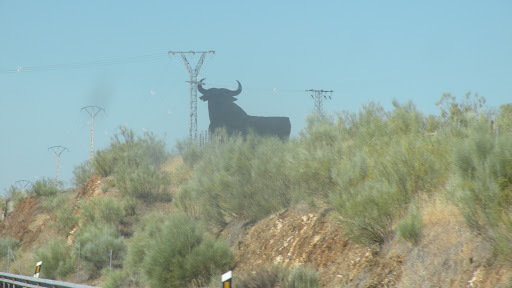 Back in the 1950’s the Osborne sherry company erected these bulls all over the country. They have become synonymous with Spain although I find it ironic that they started life as advertising. 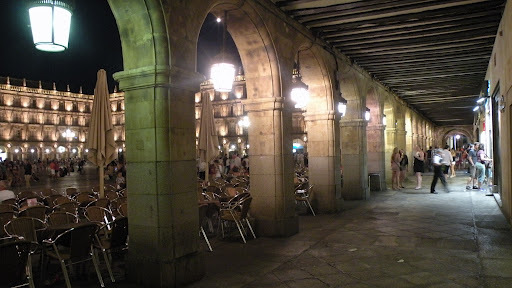 We luckily found the hotel – the Parador de Salamanca – quite easily. I had chosen a parador for a bit of a splurge. I’d read about paradors and wanted to check one out. Paradors in Spain are usually located in historic buildings such as convents and palaces. They are meant to have a certain level of luxury with prices to match. Fortunately, thanks to booking.com, I booked the Salamanca parador for just over 100 euros – much, much cheaper than advertised on the parador web site. The parador in Salamanca is one of the few modern paradors in Spain. 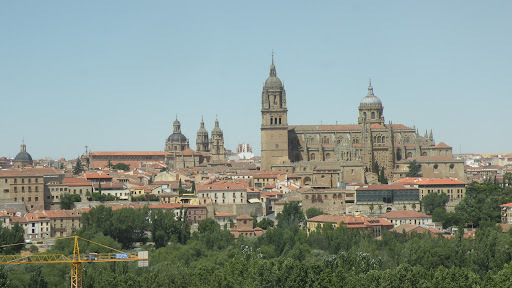 Its main claim to fame is its location overlooking the skyline of old Salamanca. Salamanca turned out to be a great stop. We strolled across the river to the old town pictured above and spent a great evening exploring the art deco museum and then getting tapas and wine. The art deco museum was a great find (thank you Rick Steves!). 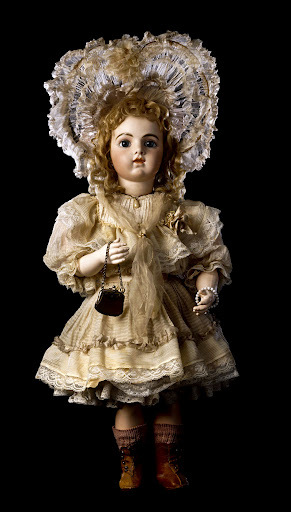 The museum houses a lovely collection of objects d’art from the art nouveau and art deco periods. 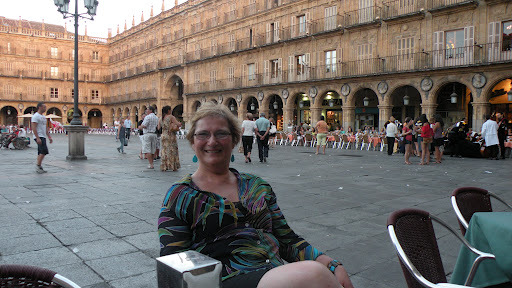 We wandered up the hill into Salamanca’s lovely old town. Very little car traffic is allowed so the streets are clear and easy to walk. As the sun began to go down, more and more people flooded into the streets. We arrived at the main plaza – the Plaza Mayor – to find it packed with thousands of people waving placards. Spain’s austerity measures were not going down well with the citizens of Salamanca. The protest was one of the most good-humored I’ve ever seen. The crowd consisted mostly of families and middle aged or older people smiling and laughing as their periodically brandished their signs. The gist of most signs was a very large, red “NO”. The protest moved off in an orderly manner and we snagged a table to look out over what must be one of the loveliest plazas in Spain. The Plaza Mayor appears to be pretty much square, lined on all four sides by uniform facades that date from the 18th Century. We enjoyed some wonderful people watching. An interesting observation was the many young women strolling past wearing short frilly skirts. And almost all of them had extremely long legs! Really… it was quite remarkable. I’ve never seen so many young women in one place with legs that literally seemed to go on forever. An interesting cultural anomaly. 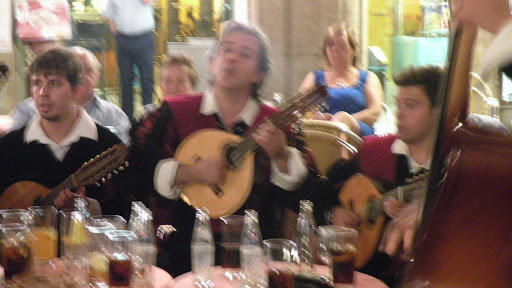 Bands of young men dressed in medieval garb played Mexican-sounding music as we sipped our wine and ate tapas. We wondered why the music sounded so Mexican and then later someone told us that Salamanca has maintained many ties with Mexico and Latin America. 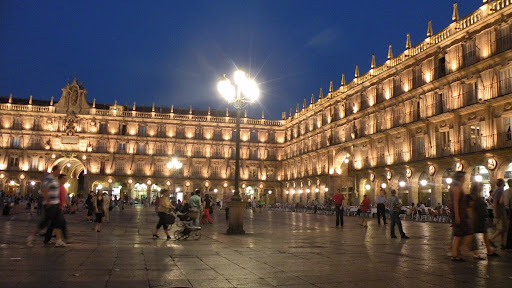 Apparently many of the people who emigrated to Mexico came from Salamanca and some of the richer ones have returned to make Salamanca so prosperous looking. It certainly is a beautifully maintained city. Here are some shots of the stunning Plaza Mayor. At around 10:30 when the light still hadn’t faded all that much, the electric lights were turned on and everyone in the square gasped much to the amusement of our waiter who just rolled his eyes. I guess he sees it every night. We finally tore ourselves away from the plaza and made our way back down the hill and over the river to our lovely hotel. Well, actually, we kind of got lost and ended up taking over an hour to accomplish a twenty minute walk, but whatever…!